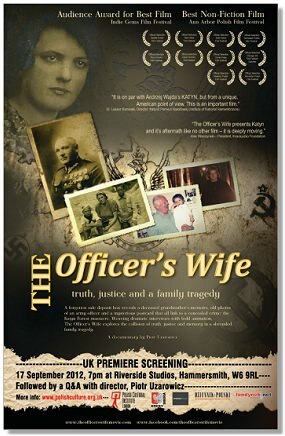 The film The Officer's Wife will be screened in the UK in September 2012. It tells the story of what happened to the film maker's grandmother during the 2nd World War. Of how her husband a Polish Army Officer was captured by the Soviets and executed by them, along with over 20,000 other Polish Officers, in what has become known as the Katyn Massacre. She herself was deported by the Soviets to Siberia. She survived but so many of her fellow Poles did not. 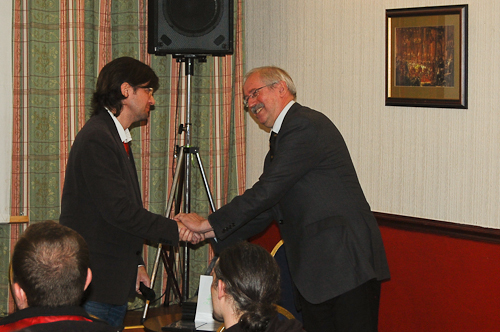 Photo: Tomasz Trafas (right), Polish Consul General in Edinburgh, congratulates Piotr Uzarowicz after the screening of his film The Officer's Wife at the Polish Sikorski Club in Glasgow on 16 September 2012. This page was added on 08 September 2012. Updated on 16 September 2012.